Wild is a story of a 26 year old woman who after the loss of her mother, a divorce and distancing of her siblings decides to walk the Pacific Crest Trail…alone! In 1995, a novice backpacker, Cheryl Strayed, begins her 1,000 mile 100 day trek from Mojave California to Bridge of Gods at the border of Oregon and Washington State. Along the way she encounters other hikers, record snow fall, small black frogs, a bull, a lecherous man and the loss of her toe nails. Her grit and determination does not allow her to give up, though she wanted to, many times. Monster, her backpack which she had initially overloaded, contained all of the things she would need; tarp, tent, flashlight, change of clothes, an anorak, camp stove and utensils, first aid kit, her beloved books and a 200 page sketchbook which she would use as a journal. Most evenings, in the quietness of her tent, she would read from one of the books she had packed. Unfortunately, in the morning, to lighten her load, she would burn the pages she had read the night before. Along the way there would be outposts where she would stop and pick up the needed supplies, especially cash, which her friend would mail. 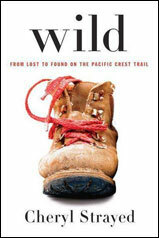 Wild: From Lost to Found on the Pacific Crest Trail is a story that will make you laugh, cringe, cry, and want to know the outcome. This entry was posted in Recommendations, Uncategorized and tagged Cheryl Strayed, Oprah Winfrey Book Club 2.0, Wild by ccld. Bookmark the permalink. Your book review presentation to the Friends of the CCLD made me want to read this book. I don’t think I would have read it if it hadn’t have been for you. I greatly enjoyed your review here as well.